KWA has a reputation for making some of the finest GBB pistol replicas on the market, and in the last few years, they've made quite a splash with their originally designed ATP (Adaptive Training Pistol). The ATP was designed, as the name suggests, as a training gun which replicates the features of other guns into a very ergonomic and easy to use platform. Seeing the success of the standard ATP, KWA has recently released a fully automatic model, creatively named the ATP Auto. Let's take a closer look at this training pistol to see if it might fill your airsoft needs! 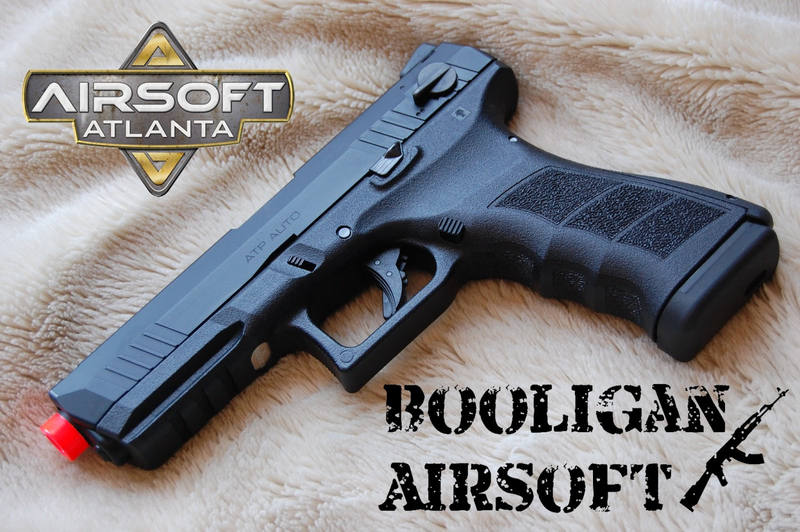 I ordered this pistol through Airsoft Atlanta, who has it available HERE, currently priced at $149.99. Spare mags are also available HERE priced at $29.99. The gun was sent to me very quickly using 2nd day air, and it arrived safe and without any visible damage. I want to take a second to thank Airsoft Atlanta for their continued review support, as without their help, reviews like this wouldn't be possible! As mentioned before, the ATP is an original design by KWA, however, it shares many features and similar controls to KWA's previously discontinued Glock series. This makes it a great training analogue for people who carry full size Glock pistols. It has a few features that make it more comfortable and easier to use including interchangeable backstraps, a slightly higher grip, and a slightly thinner, more ergonomic grip design. If you've ever used a Glock pistol, the ATP will feel right at home in your hand and you'll be able to start shooting right away. The ATP came packaged in a standard "one size fits all" KWA box with a small sticker at the bottom indicating the ATP Auto held within. A white styrofoam inner liner kept everything secure during shipping so it arrived to me in one piece. As soon as I pulled the ATP out of the box, I was a bit surprised with how big it felt in my hands. It's been a while since I've handled a full size pistol of this design, and I was impressed with how it felt substantial, but still comfortable due to the rounded angles on the grip. Along with the pistol itself, KWA included a second backstrap, magazine loading tool, small bag of BBs, small dropper of silicone lubricant, hop-up adjustment tool, warranty card and manual showing the finer details about the proper way to use this thing. It's quite a decent package, only requiring you to provide gas and ammo of your choosing in order to use the ATP. The ATP is considered a full metal replica, as everything that would be metal on the real gun, were it modeled after one, is metal on this gun. The frame is made of a nicely textured polymer material and the slide and barrel are made of metal. The whole gun has a satin black finish which adds to the realistic and professional look of the ATP. The ATP features an ergonomic grip with 2 interchangeable backstraps to customize the fit for different sized shooters. The backstrap can be removed by tapping out the pin at the bottom using a hammer and punch and sliding the strap off the frame. This pin was damn tight on my gun and required some serious motivation to come out. The back, sides and front of the grip are all aggressively textured to help you keep a solid grip on the ATP. The controls are very basic and are designed with right handed shooters in mind. The trigger is plastic with a safety lever in the middle to keep you from accidentally discharging the gun. A slide catch is located on the left side of the frame and has a small protrusion to help you activate it. The magazine release is also located on the left side and can't be swapped to the other side. Again, this gun is designed for righties, so left handed shooters will need to adapt, rather than adapt the gun for them. At the front of the frame you will find a full size 20mm rail with three slots for locking your chosen accessory in place. A small serial number plate is located near the trigger guard, and I believe the serial number is unique for each gun. The metal slide has a nicely applied finish that seems to be quite solid. There are some small casting defects visible on the side, near the trademarks, but it isn't hugely visible. Cocking serrations can be found at the front and rear to help you chamber a round before firing. On the left side of the slide, you'll find a selector switch with two official settings and one unofficial one. The selector needs to be switched with the slide pulled back to ensure that it goes smoothly into the selected position. The top is semi-auto, bottom is full auto, and if you click it into the middle, it acts as a bit of a safety preventing the gun from being cocked. The outer barrel is, thankfully, made of metal as opposed to the polymer on most other current KWA pistols. The tip is finished in a two stage orange painted color for federal compliance, and there are no threads for mounting accessories. I believe the gun is compatible with KWA Glock series outer barrels, so you can swap it out for a threaded unit if desired. White dot sights are fitted front and rear and allow for easy target acquisition in most light conditions. They don't glow in the dark or anything like that, but you can find night sights on the market if so desired. As the ATP isn't based on any real gun, there are no real trademarks to be found anywhere on this gun. KWA has applied a few of their own discrete markings on the slide and frame. The marks are actually quite difficult to see, so they don't cause the gun to look unrealistic or anything like that. The included magazine is a metal Glock type unit with a special rubber bumper to prevent damage if you drop the mag. Spare mags are readily available as the gun is compatible with KWA's NS2 series Glock mags as well as the earlier semi-auto only ATP. The magazine holds 23 rounds and features a locking follower to make loading very easy. In order to refill the gas with some gas tanks/adapters, you need to pull the small locking slider at the bottom of the mag and slide the bumper forward. Rate of fire using full-auto wasn't bad, coming in around 15 RPS, however, you have to shoot it using bursts or you'll have severe cool-down and lose performance. The recoil is pretty snappy, but I was expecting a bit more during full-auto fire. I think the recoil spring is a little weak, and an upgrade here would probably make firing feel better. Range and accuracy were what I expected from a full size pistol shooting at this performance level. After feeding it with Echo 1 .25g BBs and adjusting the hop-up, I was able to consistently get my shots on a torso sized target out to 110'. Any further than that and my shots were tending to peel to the left or right as they lost the hop-up effect. Gas efficiency left a little to be desired, as I'd need to refill between BB loads in order to ensure I'd complete the second magazine load. If I took my time and did semi-auto only, I'd complete 2 magazine loads most of the time, but once I started doing full auto, I'd generally be limited to one magazine load of ammo and still have the ability to lock the slide back on empty. Accessing the internals of this gun is a breeze and requires no tools at all. First, you just pull the slide back with the magazine out, and lock the slide using the catch. Flip the selector switch to the middle section between full and semi-auto, and pull down the disassembly lock while releasing the slide catch. You can then pull the slide off the front of the frame in order to access the internals as needed. Inside the frame, you'll find the striker assembly as well as the trigger components. Make sure that you keep these areas well lubricated in addition to the frame rails. Inside the slide, you'll find the barrel and hop-up assemblies as well as the blowback unit. At the rear of the blowback unit, you can see the bar and catch assemblies that allow the full-auto function to operate. Make sure that these areas are kept clean and lubricated as they were common failure points on the earlier KWA G guns. The inner barrel features an O-ring to keep it centered inside the outer barrel, and this must be kept well lubricated as well. The hop-up unit uses a breach accessible adjuster which is manipulated using the included tool. The ATP uses a normal KWA hop-up unit, so if you disassemble it fully, don't lose the small ball bearing that rests on the bucking. One of the main perks of this gun is the fact that it uses standard KWA compatible G-series parts and accessories. From inner components to outer accessories, the sky really is the limit as far as your customization options. The gun works with most G17 compatible holsters, so it's easy to stick on your gear. I'm not sure what I'll be doing with mine, probably some wacky custom build-up, but that'll be a post for another day! I initially reported on the ATP a few years ago at SHOT Show, and since then, I haven't heard a bad thing about it. By nearly all counts, the original ATP was very successful platform, so the eventual creation of the "Auto" version was inevitable. I'm happy to report that this full auto version feels right at home, as a former user of the KWA G18C platform. It's comfortable to hold, customizable for most users, and the performance out of the box is ready to bring onto the field. Many thanks again to Airsoft Atlanta, and of course, Airsoft Retreat! I have a KWA Glock 18 that I bought about seven years ago and it has held up so I decided to purchase the ATP. I received this item two days ago. My first impression of the ATP was that it is well made and balanced. The ATP has serrations on the front and back of the weapon and a working rail on the bottom of the frame. The sights are well made and easy to acquire. The weight of the magazine ensures that it is a simple process to drop the magazine and the slide locks back on an empty magazine. The ATP definitely feels more substantial than the older Glock 18, upon inspecting the internals it appears to be sturdier inside than the older model. In the past two days I have put about 250 .25 bb's through the ATP. I needed to make a slight adjustment to the hop up and then everything was perfect. I experienced no malfunctions and the bb's flew out of the barrel.The ATP feels great in my hand, the trigger is crisp and I am most surprised with the sights, which I found better than the actual stock sights on a real Glock handgun. Overall very impressed with this gun. encountered a few jams with the atp auto and found out it was due to the spring guide dislodging from set position. after the last jam, turns out the plastic spring guide broke. I replaced it with a guarder g18 spring guide and for now it works. now i'm dealing with the occasional auto bursts in semi-mode. any suggestions or advice on how to correct? Dave, I haven't had that issue, so I'd check with the KWA Support Forums to see if they have any advice!